, baron of Albone, first physician to their Britannic majesties James I. and Charles I. was the son of Louis de Mayerne, author of a “General History of Spain,” and of the “Monarchic aristo-democratique,” dedicated to the States-general. His mother was Louisa, the daughter of Antoine le Masson, treasurer of the army to Francis I. and Henry II. in Piedmont. Louis de Mayerne retired to Geneva about the end of 1572, after having had two houses at Lyons pulled down on account of his religion. On Sept. 28, 1573, his son Theodore was born, and had for his godfather Theodore Beza. He learnt polite literature in his own country, and he was thence sent to Heidelberg, where he stayed some years; after which, as he had made choice of physic for his profession, he went to Montpellier, and there he took the degree of bachelor in 1596, and of doctor in 1597. Thence he went to Paris, where, by way of introducing himself into practice, he gave lectures in anatomy to the young surgeons, and in pharmacy to the apothecaries. He acquired reputation by his prescriptions, and became known to Riverius, first physician to Henry IV. who recommended him so effectually to the king, that he made him one of his physicians in ordinary; and, in 1600, appointed him to attend Henry duke of Rohan, in his embassies from France to the princes of Germany and Italy. Upon his return, he acquitted himself in the exercise of his office very much to his credit, and was in high favour with the king, who promised to do great things for him, provided he would change his religion; and, it is said, notwithstanding that obstacle, would have appointed him his first physician, if the Jesuits, who were aware of it, had not prevented him by the means of queen Mary de Medicis. Of this circumstance and intended favour, Mayerne knew | nothing till he learnt it, in 1642, in England, from Caesar duke of Vendosme, a natural son of France. In 1607, he had under his care an Englishman of quality, who after his recovery carried him into England, where he had a private conference with king James. He then returned to Paris, and remained there till after the assassination of Henry IV. in May 1610. In the following year, the king of England caused him to be invited by his ambassador, to serve in quality of first physician to himself and his queen, and gave him a patent, sealed with the great seal of England; in which office he served the whole royal family with great honour and approbation, till the day of his death. 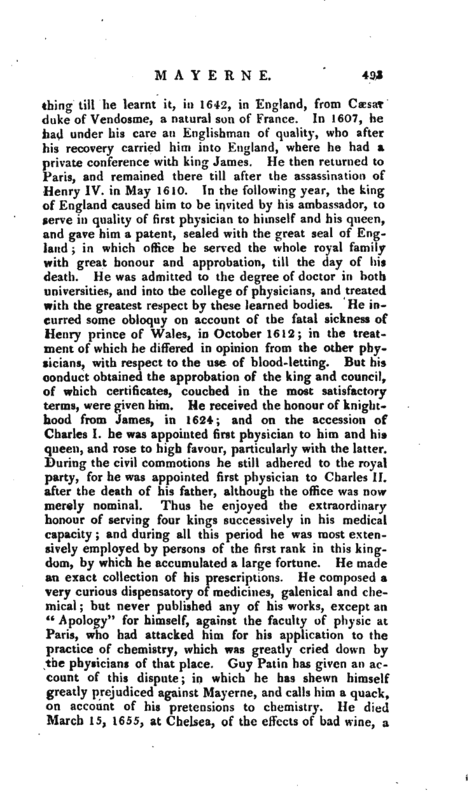 He was admitted to the degree of doctor in both universities, and into the college of physicians, and treated with the greatest respect by these learned bodies. He incurred some obloquy on account of the fatal sickness of Henry prince of Wales, in October 1612; in the treatment of which he differed in opinion from the other physicians, with respect to the use of blood-letting. But his conduct obtained the approbation of the king and council, of which certificates, couched in the most satisfactory terms, were given him. He received the honour of knighthood from James, in 1624; and on the accession of Charles I. he was appointed first physician to him and his queen, and rose to high favour, particularly with the latter. During the civil commotions he still adhered to the royal party, for he was appointed first physician to Charles II. after the death of his father, although the office was not merely nominal. Thus he enjoyed the extraordinary honour of serving four kings successively in his medical capacity; and during all this period he -was most extensively employed by persons of the first rank in this kingdom, by which he accumulated a large fortune. He made an exact collection of his prescriptions. 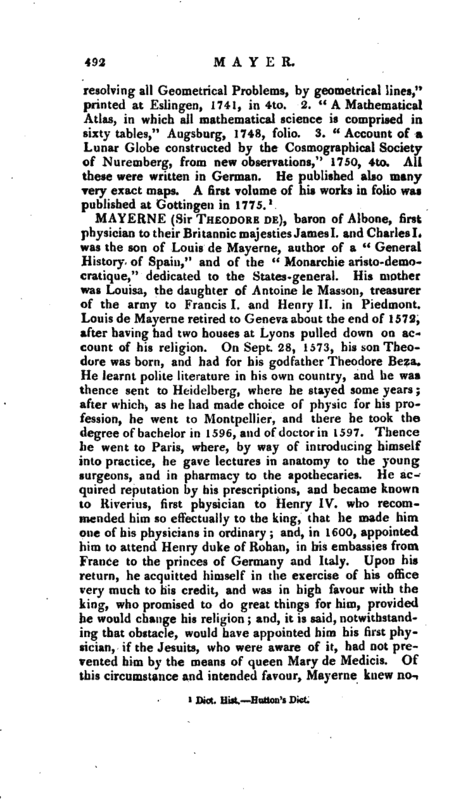 He composed a very curious dispensatory of medicines, galenical and chemical but never published any of his works, except an “Apology” for himself, against the faculty of physic at Paris, who had attacked him for his application to the practice of chemistry, which was greatly cried down by the physicians of that place. 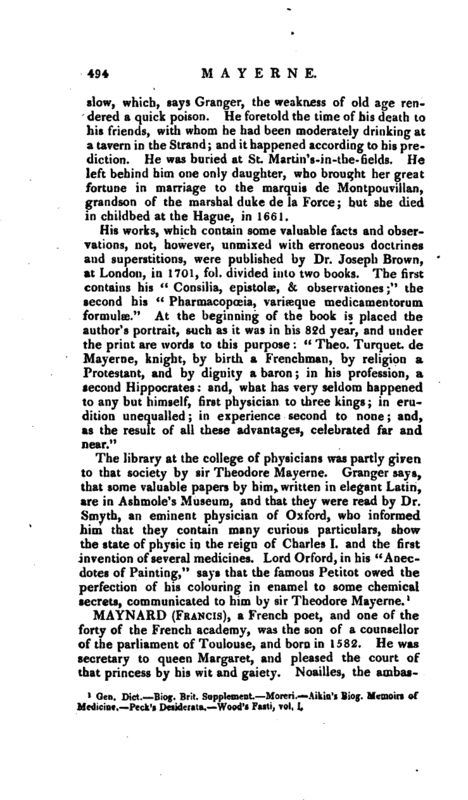 Guy Patin has given an account of this dispute; in which he has shewn himself greatly prejudiced against Mayerne, and calls him a quack, on account of his pretensions to chemistry. He died March 15, 1655, at Chelsea, of the effects of bad wine, a | slow, which, says Granger, the weakness of old age rendered a quick poison. He foretold the time of his death to his friends, with whom he had been moderately drinking at a tavern in the Strand; and it happened according to his prediction. He was buried at St. Martin’s-in-the-tields. He left behind him one only daughter, who brought her great fortune in marriage to the marquis de Montpouvillan, grandson of the marshal duke de la Force; but she died in childbed at the Hague, in 1661. Gen. Dict. Biog. Brit. Supplement. —Moreri. Aikin’s Biog. Memoirs of Medicine. Peck’s Desiderata. Wood’s Fasti, vol. I.